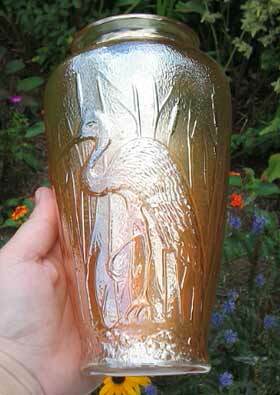 These 7 1/2-inch tall vases usually have just so-so iridescence, and only in marigold. At live auctions they bring between $5 and $10. The example shown here sold on eBay in 2005 for $162. Similar to Jenkins' Golden Flowers vase. Photo courtesy of Samantha Prince.